A silky smooth flanger effect that can go from subtle to extreme in an instant. This unit models Classic, M-Tron and Stompbox flanger models that are still the industry standards. 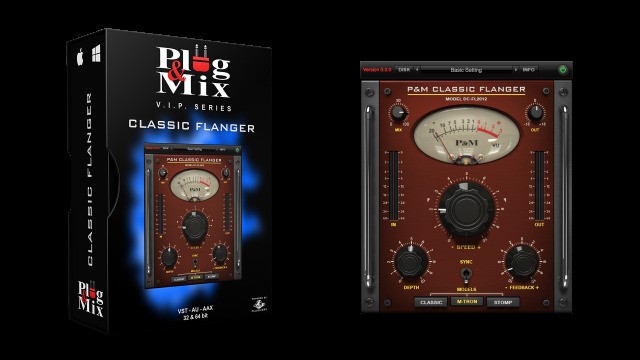 Guitar players will find the P&M Classic Flanger especially easy to use because of it's simple, familiar layout. Choose from 3 different Flanger models and then use the Depth and Feedback knobs to adjust the strength of the effect. The big Speed knob adjusts the rate of the flanger and can be synched to your master tempo by flipping the Sync switch below. - Speed : Changes the speed of the flanging effect. - Depth : Changes the depth of the flanging effect. - Sync : Synchronizes the speed (rate) of the flanger to your host BPM. - Feedback : Adds positive or negative feedback. - Selector buttons : Choose between Classic, M-Tron or Stomp flanger modes.